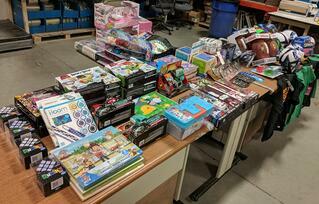 A group of employees decided to combine their $50.00 together and purchase Christmas gifts for kids in need at the Boston Medical Center. BMC provides excellent and accessible health services to all in need of care regardless of status or ability to pay – exceptional care, without exception. As a result of the team coming together, over 80 gifts were purchased (BMC’s wish list was 70 gifts) for both the pediatric unit and children in the asthma unit, were children typically spend an extended period of time. Gifts (as recommend through BMC’s team) included books, puzzles, brain games, dolls, action figures, footballs, basketballs, clothing, jewelry, and tech gifts, as well as some iTunes gift cards for the teenagers. A group of WEI employees matched the Random Act of Kindness contribution and adopted 3 families in the Salem, NH area for Christmas through a non-profit in Hampstead, NH called ‘Isaiah58’. 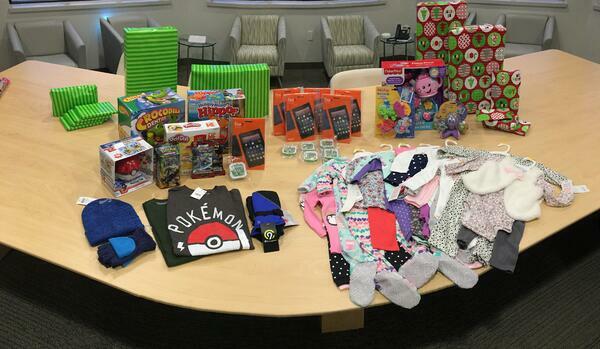 The families provided lists of items their children would want for Christmas and our employees were able to provide these children clothes, games, toys, DVDs, and each child also received an Amazon Fire 7 tablet. One employee heard of a single mother of three that is trying to move closer to the restaurant she works at and offered her $50 to assist with the move. Another employee took her children to a local park where there are often several homeless people. Her children gave five people a $10 bill and a small gift bag containing gloves, a hat, and pumpkin bread. Other employees donated to Gifford Cat Shelter, Homeland Heroes (an organization that works to help active duty military, veterans, and their families), and Massachusetts Vest-A-Dog (an organization that helps provide bulletproof vests for Massachusetts Police Dogs). The Tough Ruck Foundation is another organization that benefited from this initiative. Tough Ruck is a group of military and civilians whose sole purpose is to Ruck in honor and in memory of our Fallen Service Members, Police, Firefighters and EMTs, while raising funds to support military families in times of need. The term “Ruck” refers to the 26.2 mile route each individual will walk while carrying a fully weighted backpack of roughly 35 lbs as well as the name of a fallen hero the entire way. WEI employees are constantly trying to better its surrounding community with its Random Acts of Kindness initiative, as well as with other WEI StepsUp initiatives. Rosas added, “This generosity of spirit serves as an example that small lights united together create a beacon for all to follow.” This initiative provided another reason employees love working for and being a part of life at WEI. Next Steps: For more information about our community outreach efforts, follow the hashtag #WEIStepsUP on Facebook, Linkedin, and Twitter, and click below to visit our WEI StepsUp page today to learn more about life at WEI.